Ardis Ankerson (September 29, 1915 – July 30, 1992), known as Brenda Marshall, was a Fillipino-born, American film actress. Marshall made her first film appearance in the 1939 Espionage Agent. The following year, she played the leading lady to Errol Flynn in The Sea Hawk. After divorcing actor Richard Gaines in 1940, she married William Holden in 1941, and her own career soon slowed. She starred opposite James Cagney in Captains of the Clouds (1942). Marshall had a popular success in The Constant Nymph (1943), but she virtually retired after this, appearing in only four more inconsequential films. In one of these, she played scientist Nora Goodrich in the B picture cult classic Strange Impersonation (1946). In 1955, five years after her last film role, she made an appearance as herself (billed as Mrs. William Holden) in the fourth-season episode of I Love Lucy entitled "The Fashion Show". Marshall was born in the Philippines of Swedish parents. She was one of two daughters of Otto Peter Ankerson, overseer of a large sugar plantation near Bacolod. Her mother died in 1925 when she was young, so Ardis, along with her older sister Ruth, attended grammar school and began high school studies as boarding students at the Brent School in Baguio City. In the early 1930s, the girls were sent to San Antonio, Texas, to complete high school. She attended Texas State College for Women in her freshman and sophomore years, 1933–35, and was named the Freshman Class Beauty in 1934, chosen by modern dancer Ted Shawn. Brenda Marshall was her stage name, but she refused to use the name off-camera and insisted that her friends call her by her real name. 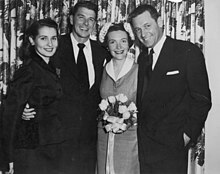 She married the actor Richard Huston Gaines in 1936, and they had one daughter, Virginia; the couple divorced in 1940. In 1941, Marshall married actor William Holden, who subsequently adopted Virginia Gaines (born November 17, 1937, New York City). Marshall and Holden had two sons together, Peter Westfield "West" Holden (1943–2014) and Scott Porter Holden (1946–2005). After several separations, Marshall and Holden were divorced in 1971. Marshall died in 1992 from throat cancer in Palm Springs, California, aged 76. Highway West Claire Foster 62 mins. ^ Some question exists regarding the exact date of her birth. An article in the December 31, 1939, issue of the Salt Lake Tribune says that she was born November 29, 1915. Clark, W.K. (December 31, 1939). "It's Another Brenda's Year". The Salt Lake Tribune. Utah, Salt Lake City. p. 49. Retrieved June 25, 2016 – via Newspapers.com. ^ "The Milwaukee Journal - Google News Archive Search". news.google.com. Retrieved 2018-03-28. ^ Famous Alumnae Archived 2010-11-29 at the Wayback Machine, Texas Woman's University website; accessed September 8, 2015. ^ Capua, Michelangelo (2009). William Holden: A Biography. Jefferson, NC: McFarland. pp. 29–31. ISBN 978-0-7864-4440-3. ^ Fessier, Bruce (September 29, 2014). "West Holden: More than just the son of William Holden". The Desert Sun. Palm Springs, California. Capua, Michelangelo (2009). William Holden: A Biography. Jefferson, NC: McFarland. ISBN 978-0-7864-4440-3. Wikimedia Commons has media related to Brenda Marshall. This page was last edited on 10 April 2019, at 07:16 (UTC).